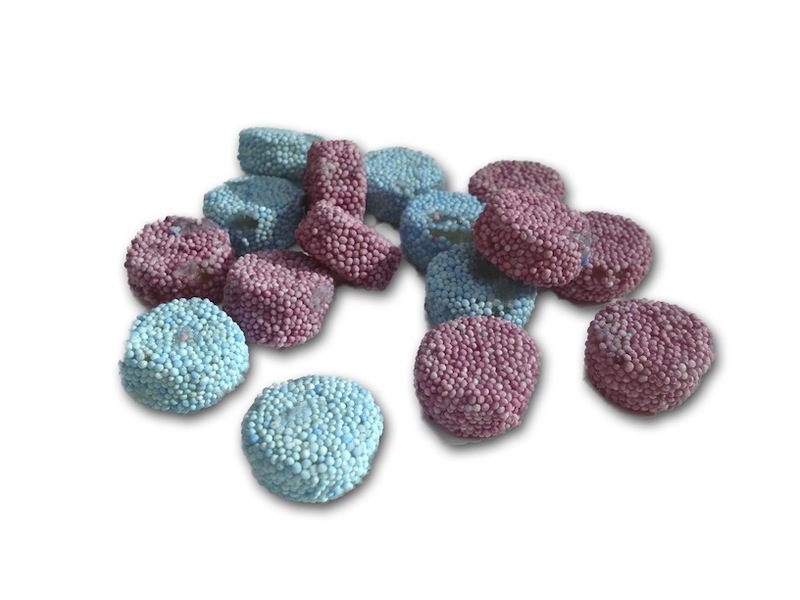 Recently I contacted Aunty Nellie’s Sweet Shop in Ireland to get my hands on some more of those blackcurrant hard candies I’m nuts for (turns out they’re actually aniseed candies.) The extremely helpful person who worked there offered to make a grab bag for me of other black currant and aniseed/licorice treats. While most everything she selected was wonderful, the Spogs….well….they’re Spogs. Pretty, right? Pretty for things not found in nature, perhaps. 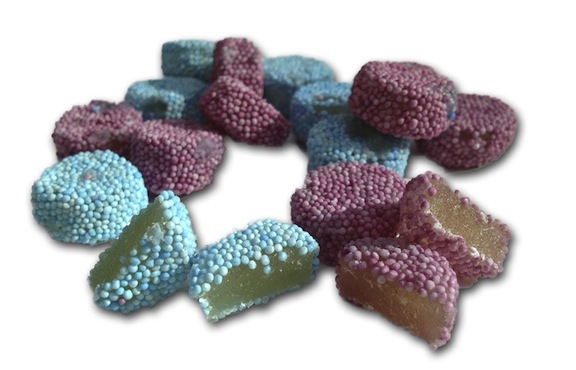 “Jelly Spogs” as they’re commonly called are an aniseed jelly treat coated in those little non-pareil thingies. They’re definitely NOT pareils. Usually, these come included in traditional licorice “allsorts” collections, which are more or less a bunch of different kinds of licorice in a sampler. But still, the ingredients didn’t put me off. It’s the damn taste. WOW. Talk about intense. From someone like me who adores licorice-the more intense the better, usually-I couldn’t take these. The non-pareils are a nothingburger. But the jelly is a noxious, powerful, sharp, heady attack of aniseed intensity. It’s very rare that something from the licorice family turns out to be a spitter for me, but…these are. I appreciate that these are a classic European candy, that’s all fine and dandy. But I defy any of you to tell me that you actually enjoy these. In fact, I don’t believe that ANYONE actually likes these, because that just doesn’t seem possible. However, if you wanna prove me wrong, please do-leave a comment and explain to me what I’m missing. Until then however, I feel safe condemning these into the deepest chambers of hell for all of eternity. Actually, these cannot be licorice but, gummy. Licorice has no gelatine in it unless it’s filled. In any case beef gelatine makes gummy less chewy and hard rather than the pork gelatine. Europen style gummies should also have pork gelatine in them because, it’s less expensive than beef gelatine. Therefore I’m guessing that these should have come from somewhere else originally and they also are halal. They must have been imported from Turkey or Malesia or some other Halal manufacturing country.